During our visit to South Africa, we tried many wines from Stellenbosch, Hermanus, Paarl and Robertson. By far all of the wines are excellent. We drank more whites that month then reds. We did try to drink many reds. Some were better than others. We also tried many red Bordeaux blends. For the most part, they were okay. Some were green, oaky and not balanced. Give the winemakers time and they will perfect Bordeaux blends like the other great wines they make. I did spend three weeks in Stellenbosch helping David van Velden at Overgaauw Wine Estate. Davids winemaking techniques were self-taught and he also spent time in Bordeaux learning from the masters. I am not trying to be biased, but I do believe his Tria Corda is an excellent Bordeaux red blend and would compete with wines from Bordeaux and California. Aromatic, young-fruity with aromas of dark fruit, dark cherry, spice, slight oak, and smoke. Cassis, cocoa. Dry, full-bodied with great acidity. 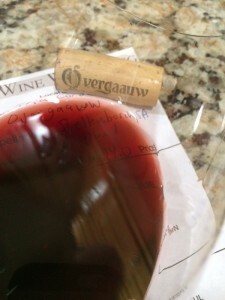 Soft integrated tannins with a long rich savory mid-palate finish. Accolades: Wine wine is only released in good years, the previous vintages were 2009 and 2006. The 2009 vintage was awarded the highly acclaimed Top 100 SA Wine Award in 2012. 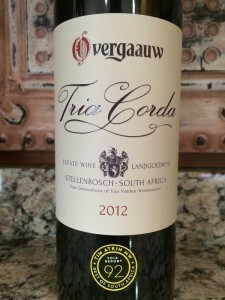 I rated the 2012 Overgaauw Wine Estate Tria Corda four glasses. It is hard to believe the quality at the price. Maybe South Africa should have a blind tasting against California wines and see how they match up.